For many years now, we have been obtaining and compiling monthly pesticide use reports from San Francisco Recreation and Parks Department (SFRPD). This is our report for 2018. Our analysis omits Harding Park, which is under contract to the PGA and must be tournament-ready at all times. 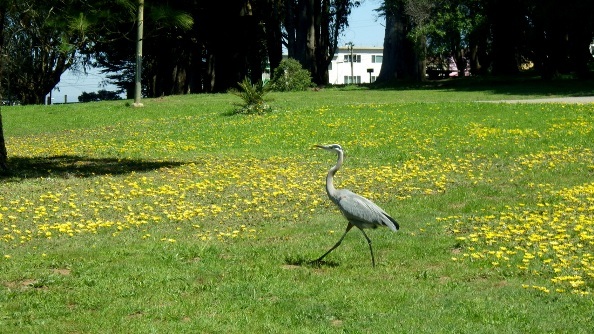 We do include other golf courses, including the nearly pesticide-free Sharp Park in Pacifica (of which more later). We analyze the data separately for the Natural Resources Department (NRD, formerly the Natural Areas Program or NAP). This is the entity that is trying to bring “native” plants to more than a thousand acres of our parks, cuts down trees and restrict access to people and their pets. (For details, see this LINK.) It uses toxic herbicides against non-native plants it considers invasive, currently nearly 50 species. 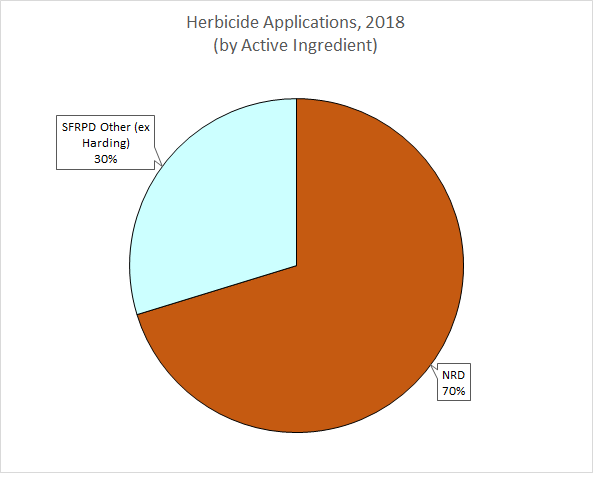 The NRD was the largest single user of herbicides within SFRPD. In fact, it used significantly more herbicides than the rest of SFRPD put together, including all the golf courses except Harding. SFRPD applied herbicides 223 times, of which 175 176 were in “Natural Areas” (this includes PUC areas managed in the same way – i.e. use of toxic herbicides against plants they dislike). SFRPD (excluding Harding, and excluding NRD) continued to reduce its use of herbicides. Which is good news. They’ve also almost stopped using Tier I products. (SF Department of the Environment – SFEnvironment – groups those pesticides that the city permits to be used on city properties into three Tiers. Tier III is least hazardous; Tier II is More Hazardous; and Tier I is Most Hazardous.) The only usage in 2018 was Roundup Custom on a tree stump in Duboce. There are some disturbing developments; the drop was a mere 6%, compared to a 34% fall in 2017, a 56% decline in 2016, and 30% in 2015. 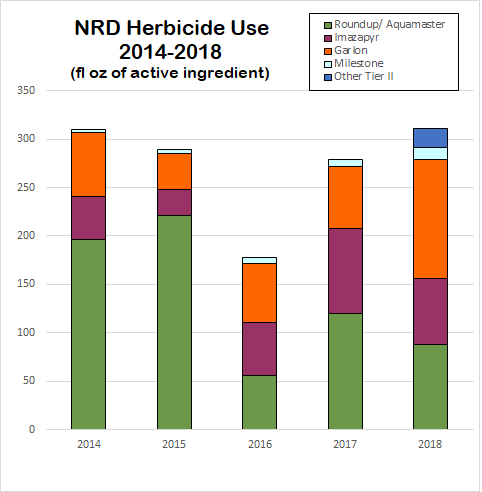 NRD dropped its pesticide usage sharply in 2014, and continued the decline through 2016. But in the last two years it started climbing again, and it now is at the highest it’s been in five years (see the graph below). They’ve added another Tier II pesticide to their arsenal: Axxe, which they tried on oxalis. On the whole, this herbicide is probably not as bad as some others; it has an OMRI listing for organic use. They also used Clearcast on Lake Merced against waterplants. The really bad news, though, is the increase in the use of Garlon (triclopyr), the most toxic herbicide that SFEnvironment permits. It’s what they use in their perennial, pointless, and apparently escalating war on oxalis. The increase is clearer in the graph below. 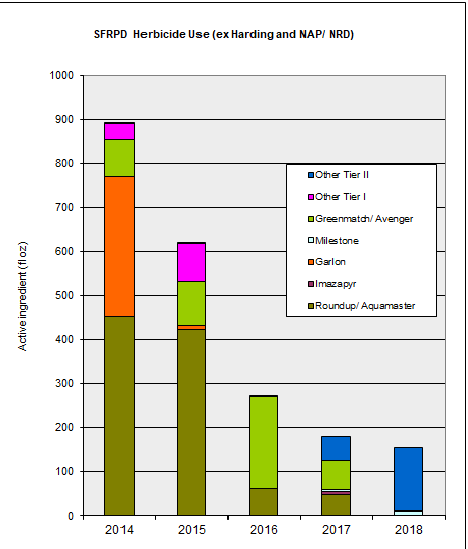 (The orange columns are Garlon.) NRD increased its use of Garlon by about 90% from 2017, and it’s the highest it has been in the last five years. 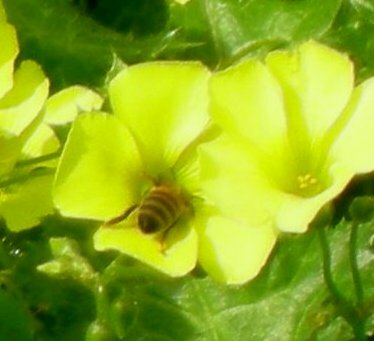 Oxalis is a beneficial plant: It produces copious amounts of nectar, which is food for bees, butterflies, and other pollinators. Its bulbs provide food for (native!) pocket gophers and some birds. Its brilliant yellow flowers bloom early in spring, before most other flowers. Kids like to chew on its sour stems (it’s also called sourgrass) and even adults have fond memories of this plant. Other than nativist purists, most people love it for its beauty – it’s a sign of spring in San Francisco. Last year, SFRPD declared war on Cape Marigold, arctotheca. 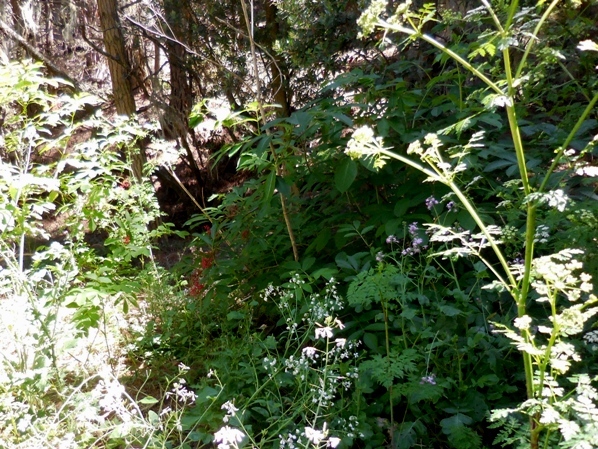 This is a ground-cover plant that’s attractive to butterflies, bees, and other pollinators, but is considered “invasive” – i.e., successful in the urban environment we currently have in San Francisco. In 2018, this attempt resulted in 21 applications of herbicides (of a total of 223), including the first time since August 2010 that pesticides have been used in Sharp Park, habitat for the endangered red-legged frog and the California garter snake. Nearly all applications were of Milestone VM (aminopyralid) but one was of Sapphire (penoxsulam) – hitherto restricted to golf-courses ONLY in preparation for tournaments. On this occasion, it was being used on the St Mary’s playing field. Cape Marigold (also called the Plain Treasure Flower) has bright yellow flowers that look like daisies. It’s in the aster family, has a fairly long flowering period, and also provides food for butterflies and bees. As we said in our half-year report, three new herbicides have been added to the list permissible for use in San Francisco: Axxe (which we mentioned above), Lifeline, and Clearcast. The list of target species is also growing, and we’ve now counted 47 types of plants that are being sprayed with herbicides. The 2018 newcomers to the list are a couple of succulents: Aeonium, and crassula. Also added to the list is “Cat’s Ear,” an edible plant resembling dandelions and widespread enough that if it’s a target it would provide an excuse for considerable pesticide use. There’s another plant listed as Cape vertigo (sometimes the form is unclear! ), which may be an ornamental grass. 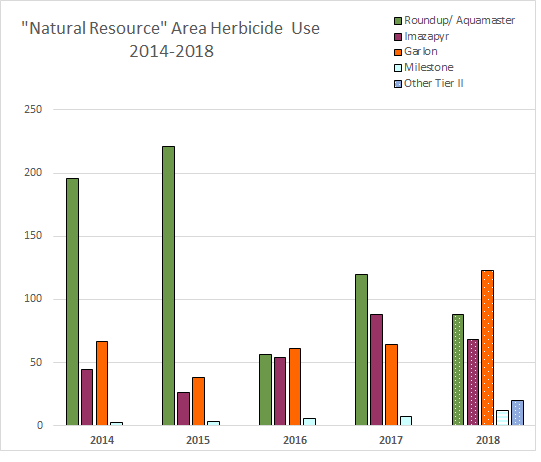 We slightly modify our conclusions from our Half-Year report in July: While we are glad that SFRPD has moved to reduce herbicide use (at least in non-Natural areas), we’re disappointed that it continues to consider pesticides a viable strategy. We’re also disappointed at the opening of more battle-fronts against plants, which will inevitably push for more pesticide usage. We’re disappointed at the rising usage by the NRD. We would like to see SF Environment take the leadership in moving San Francisco to a policy of No Pesticides in our Parks and Watersheds. 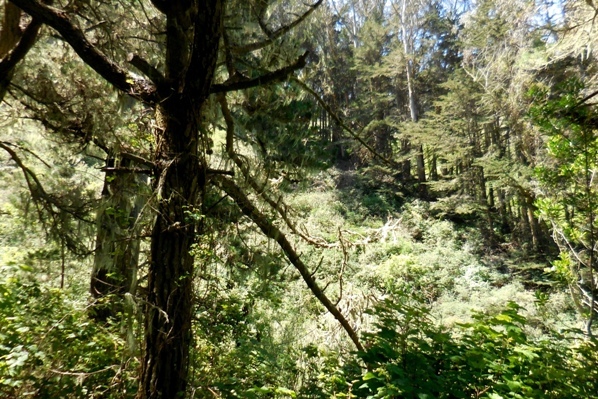 The Natural Resources Department (NRD -formerly called the Natural Areas Program) is planning to cut down more than 15,000 trees in Pacifica’s Sharp Park, mostly on hillsides east of Highway 1. This is supposed to benefit the two species that live around there – the threatened red-legged frog and the endangered California garter snake. It will most likely threaten them still further. This lake is red-legged frog habitat. And it’s not just good for the endangered frog, and presumably the endangered snakes that preys on it. All kinds of other wildlife use it. Observers have seen everything from bobcats to quail to rabbits in the area. 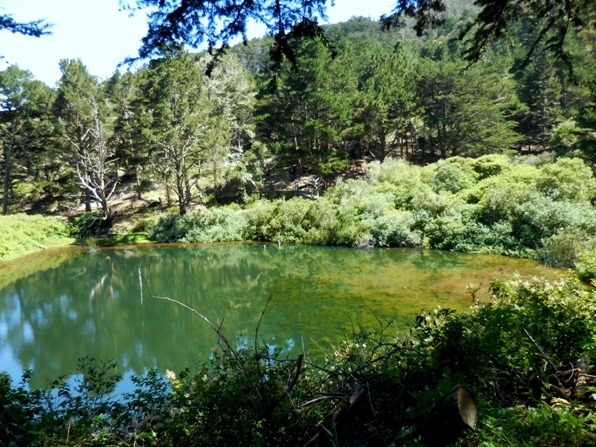 The lake, which lies to the east of Highway 1 in Sharp Park, was made by damming a seasonal creek. On the left of the picture above, you can see the earthen dam covered with greenery. Now a naturalized pond, it was originally part of the irrigation system for the Sharp Park golf course, and was fed water through pipes and a cistern. Now the golf course gets its water elsewhere, the cistern has been filled in, and the pipes in disuse or gone. This is where the old cistern was filled in. It’s invisible now under wildflowers and shrubs. So what happens when the trees are felled? We expect two adverse impacts on habitat. First, and immediately, there will be an increase in erosion, bringing mud and debris into the lake and affecting its water quality. Longer term, the lake will start to dry up in summer, since without the surrounding trees it will no longer get the water from the fog. What water it gets will evaporate more quickly without the tree shade cooling its surroundings. In dry years, it may not even get much water in winter. Its function as habitat would be severely degraded. Besides damaging the habitats of endangered species, the tree-cutting plan is environmentally damaging in many ways. Carbon sequestration: Trees sequester carbon, and preserving trees and thus fight climate change. Once they are cut down, they release this carbon back to the atmosphere. With 15,000 trees, the impact will be significant. Trees fight pollution, especially particulate pollution. 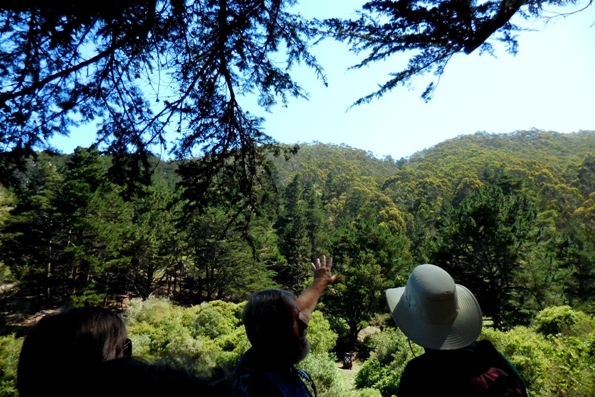 With Highway 1 running through it, and the city of Pacifica nearby, these trees are fighting the pollution that would otherwise drift into populated areas. Trees prevent erosion. The trees help to prevent erosion on these steep hillsides, and reduce the likelihood of landslides. Trees help water regulation. These trees not only increase the water available by precipitating water from the fog, they also help to store in by slowing evaporation and encouraging the growth of plants that slow run-off. This provides a green environment year-round. Imagine this hillside as a bald mountain with a few scraggly trees, brown and dry in summer. Aside from the beauty of the place, and the undisturbed wildlife habitat that would both be destroyed, we think it is environmentally irresponsible. Eucalyptus, with its dense wood, its size, and its 400-500-year life-span, is particularly effective at sequestering carbon. In foggy areas, it captures moisture from the fog and drops it on the ground below, allowing for a dense damp understory that fights drought and resists fire. It cleans the air, especially fighting particulate pollution, by trapping particles on its leaves that eventually get washed onto the ground. It stabilizes hillsides with its intergrafted root system that functions like a living geotextile. SNRAMP would require the use of large quantities of poisonous herbicides to prevent resprouting of the felled trees – herbicides that are likely get washed down the hillsides and into surface and ground water. 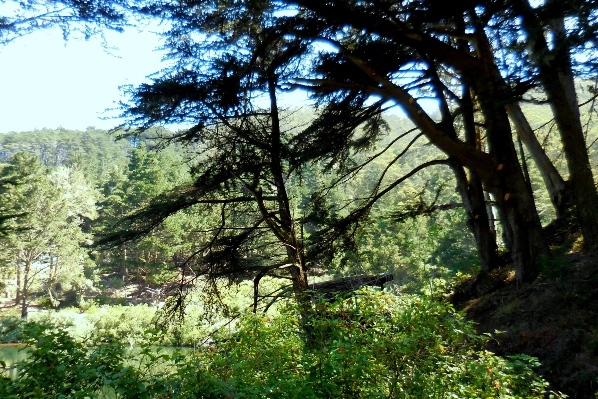 Pacifica actually has an ordinance prohibiting logging (removing more than 20 trees in a year). NRD’s answer to that is to see if the ordinance applies, and if it does, to try to get permission. 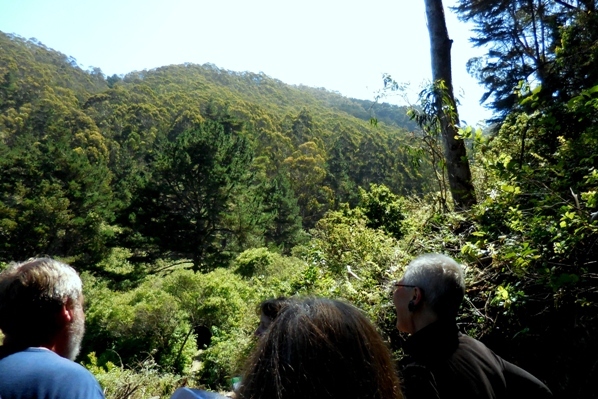 Recently, the San Francisco Forest Alliance organized a walk in Sharp Park for a small group of supporters. Not on the familiar historic golf course; this was on the freeway’s other side, in the woods around the San Francisco Archery Range. 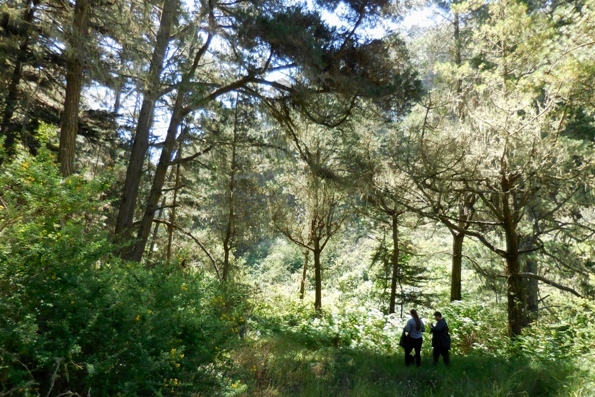 Sharp Park is where the Natural Areas Program seeks to cut down 15,147 trees. Across from the trail, another hillside was covered in trees. Further along, we got a clearer view of the lake. It’s made by damming a seasonal creek. On the left of the picture below, you can see the earthen dam covered with greenery. All the water in the lake now comes from the watershed created by the hills and forest around. Before, it used to come from a cistern that has since been filled in, and formerly provided water to the golf course. Now the golf course gets water from other sources, and this lake is used by wildlife. It’s also, apparently, red-legged frog habitat. We walked down past the lake on a little improvised bridge that crossed the creek, and up under the trees on the other side. All along the trails, little markers indicated where archers should stand to aim at the targets backed by hay bales. 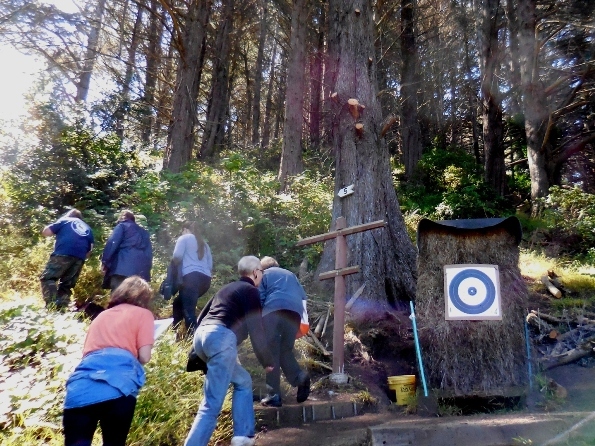 The Archers do all the maintenance on the range, using volunteers and the funds raised from their members. They use no pesticides on the range. Recently, they called in arborists to trim tree branches that had become hazardous, as in the tree in the picture above. This is the kind of maintenance that SF Forest Alliance strongly favors – dealing with hazardous trees where they could endanger people or property as a top priority. The beautiful green forest opposite climbed up the slope toward the ridge, a lovely sea of trees. There are no official trails into much of that forest, though some social trails do exist. 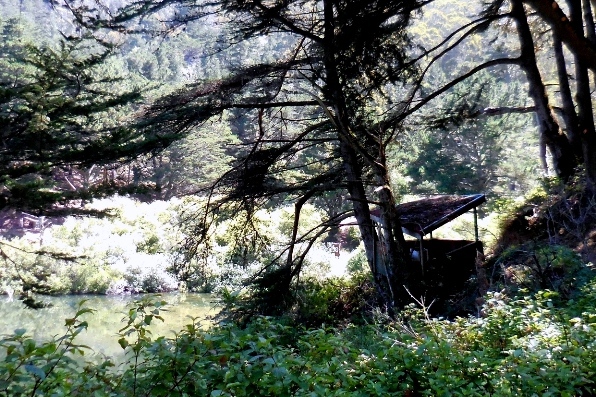 Past the lake, the trail broadened into a shaded area with a picnic table, a green-painted wooden hut, an old outhouse with sun and moon tin appliques, and another target. 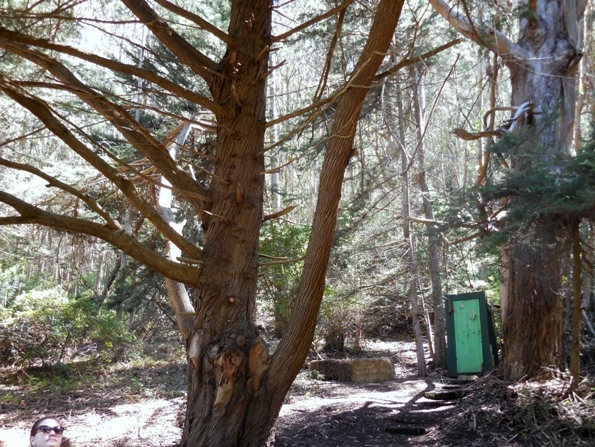 Jim explained that the hut was used for refreshments during major tournaments, but the outhouse was an antique and nailed shut. They weren’t legal any more; instead, they had porta-potties. We turned onto a pathway that followed the old pipeline. It took us deeper into the forest, which was ever more idyllic. It was hard to believe that we were only minutes from the city, or that just over that ridge, there was Skyline College. The ground was springy underfoot, and the whole place showed no signs of drought. Even the little lake, which depends on natural water, was quite full. Pacifica is foggy, and no doubt the trees had been harvesting the moisture from the fog and dripping it on the vegetation below. The area abounds in wildlife. We heard a lot of birds as we went through, hiding in the trees and bushes. On another visit, we saw rabbits and quail. Jim said the quail had raised two clutches of chicks this year. He also said there were deer, coyotes, and also bobcats. He described watching a mother bobcat teaching her kitten to hunt gophers, waiting for one to emerge and snagging it with a quick swipe of its paw. He knows of red-shouldered hawks and red-tailed hawks nesting in the area, as well as great horned owls. People think there may be mountain lions, too; they are known to range just over on the other side of the ridge, near Crystal Springs. We ended our walk in a small meadow. 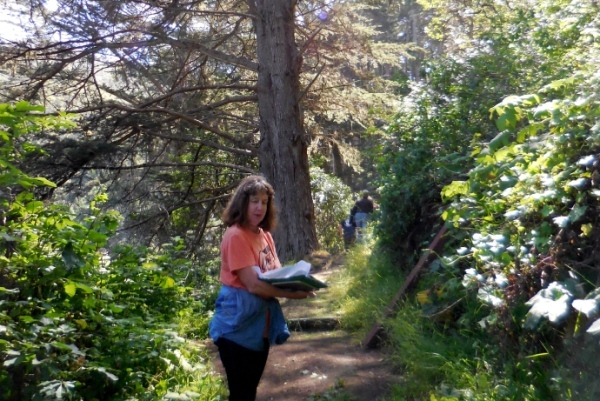 Beyond, the trail was overgrown and we were running out of time; there was a meeting at the archery club-house at noon. We hope that the trees will be saved; they are critical to the habitat and the ecology of the area. No herbicides are currently in use. There are large areas of undisturbed vegetation providing denning and nesting sites. We felt privileged to have had an opportunity to see this amazing place. 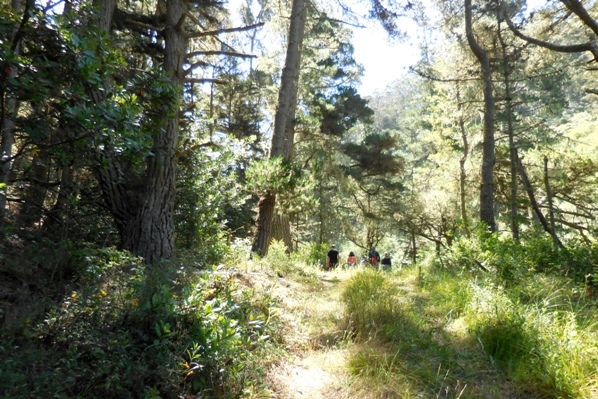 The San Francisco Forest Alliance plans more such walks in beautiful natural places, accompanied by people familiar with the area. If you would like to join us, please make sure we have your email address. (You can email us at SFForestNews@gmail.com ) We’ll be notifying our entire list. 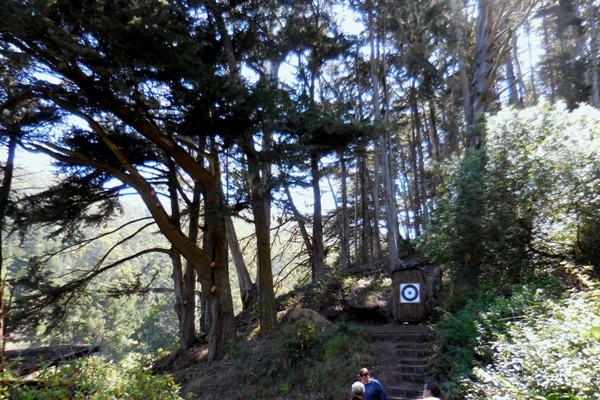 Even though Sharp Park is in Pacifica, in San Mateo County, it is owned by SF Recreation and Parks Department, and has become part of the so-called “Natural Areas Program” (NAP). 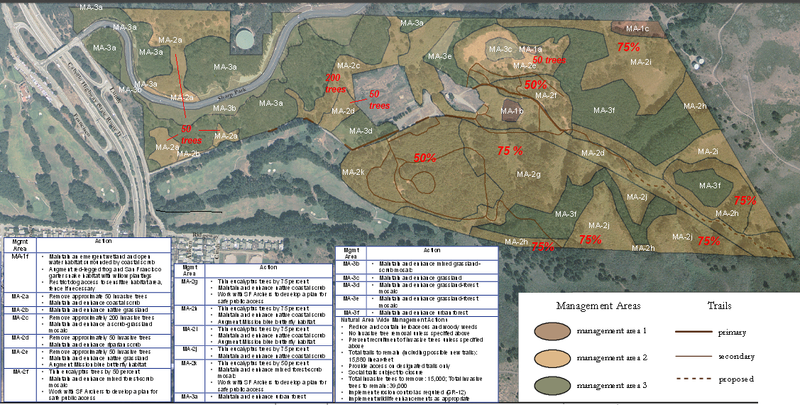 So converting this forested area into scrubland is part of their Plan – the “Significant Natural Resource Area Management Plan” (SNRAMP or “Sin-Ramp”). It calls for cutting down 15,147 trees. Here’s the plan (based on a map from the SNRAMP – click on it to make it larger). The red numbers refer to tree removals – in most places, 75% of trees; in a few, 50%; and in some areas where there are few trees now, most of the existing trees. We strongly oppose this action. Aside from the beauty of the place, and the undisturbed wildlife habitat that would both be destroyed, we think it is environmentally irresponsible. Trees sequester carbon; eucalyptus, with its dense wood, its size, and its 400-500-year life-span, is particularly effective. In foggy areas, it captures moisture from the fog and drops it on the ground below, allowing for a dense damp understory that fights drought and resists fire. It cleans the air, especially fighting particulate pollution, by trapping particles on its leaves that eventually get washed onto the ground. It stabilizes hillsides with its intergrafted root system that functions like a living geotextile. And SNRAMP would require the use of large quantities of poisonous herbicides to prevent resprouting of the felled trees – herbicides that are likely get washed down the hillsides and into surface and ground water. 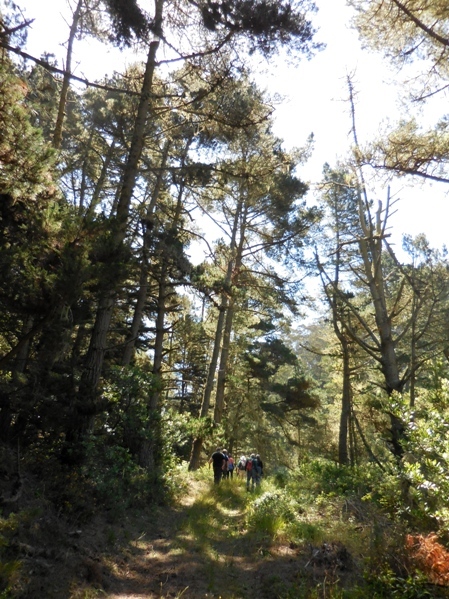 Pacifica actually has an ordinance prohibiting logging (removing more than 20 trees in a year). NAP’s answer to that is to see if the ordinance applies, and if it does, to try to get permission.